Not sure if you want to call them archives, I did these sketches back in February after we got back from the trip. They were completed around Valentine’s Day as I recall. Frank and I had a lovely Valentine’s date one day where we wandered into a coffee shop to sit and ignore each other (with love) while I painted and he worked on some pixel art, a current project of his. We also got to eavesdrop in on what was clearly a first date at the table beside us. Talk about expectations! A first date on Valentine’s day. Oof. Anyway. Sketches. These were both drawn from photographs taken towards the end of our time in Brazil. 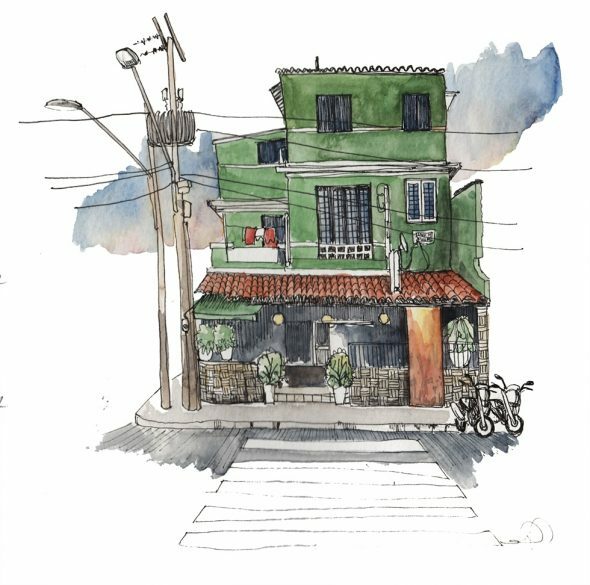 The awesome part of the green house in Fortaleza is that it was the second of my sketches to be posted to the Urban Sketchers instagram account, which brought me a few new followers. It’s been really awesome learning about that community. I’ve been itching to break out of my comfort zone and finally start sitting outside to sketch things in real time. They do a symposium every year where sketchers from around the world come together for a week of workshops and on-location sketching in groups. I couldn’t do it this year but I’ve got my eyes open for next years location. Who knows. Well…it is supposed to be an absolutely gorgeous day today. We’re both getting over a week of chest colds and 24 hour flu bugs, but I really want to get outside today on our bicycles to break a sweat and do some capoeira in the park. Who knows, maybe I can draw too. This entry was posted on Saturday, May 7th, 2016 at 9:07 am. It is filed under General Musings and tagged with Musings, Urban Sketchers, urban sketching, watercolor, watercolour, weekend. You can follow any responses to this entry through the RSS 2.0 feed.